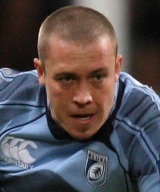 Rees came to the attention of Cardiff Blues in the colours of London Irish and joined the Welsh region in 2007. A former Ospreys representative, he represented Wales at U21 level before joining the Exiles in 2006. A livewire scrum-half with a decent eye for a sniping break, Rees originally shared much of his game-time at the Blues with former Osprey Jason Spice. Following Spice's exit from the club in 2009 Rees appeared to have slipped behind new signing Gareth Cooper in the pecking order, but some brilliant showings in the Magners League and Heineken Cup put him in pole position in heading into 2010 and was rewarded with a place the Wales squad for the Six Nations. In 2009 Rees was an early replacement for Spice, who broke his arm, as the Blues won the Anglo-Welsh Cup at Twickenham with a rout of Gloucester. He also landed a penalty in the Blues' infamous penalty shootout loss to Leicester in the Heineken Cup semi-final later in the season. With Mike Phillips injured, Rees was Wales starting scrum-half for the matches against France and Ireland in the 2010 Six Nations. He continued to make regular appearances for Wales throughout 2010 but a 12-week ban for foul play during a Heineken Cup match for the Cardiff Blues meant that he missed the entire 2011 Six Nations tournament.